by Alainat5:00 am on January 18, 2019 . It has 16 Comments. Have a great day and weekend, and enjoy the pictures! I do baking fundraisers for several causes. My main focus is Wolfwood Animal Rescue Center. They serve as a go to center for the RSPCA who bring all their rescued wildlife to them for rehabilitation. In addition they home hard to adopt dogs (elderly, disabled etc.) My Mum’s rescue JRT came from there (as have all her elderly dogs). She gives them a home for the last years of their life. Anyhoo their big fundraiser of the year is the annual dog show and family fun day in Ryelands Park. It is a really fun day, full of laughs and hopefully sunshine and silly categories. I thought the Jackals could use a post of dogs as a respite from the craziness of the current times. First up my Mum’s rescue JRT Fran. She is an absolute sweetheart and my DH adores her. This cheeky little chappie was entered into several competitions and I think he won for best smile. This guy won for Handsomest Boy and I think he deserved it. The one with eyes is deaf, the other one is blind. According to their owner when they are in the house they lead each other around. In the environment of the fair the owner thought it was best to keep them in the pushchair. So much cuteness in one thread. Just what I needed! Fran is a cutie, as are all the other winners. I am glad you’re enjoying being back home. Is there any news on your husband’s status? 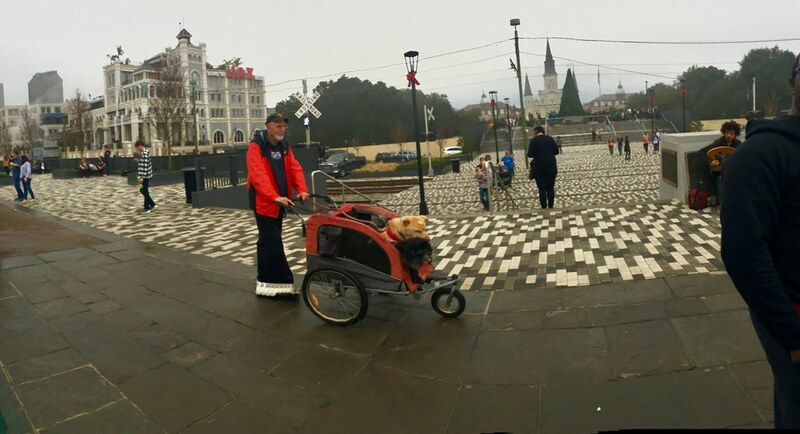 I “pushchair” our varmits too, here we are in front of Jackson Square and St Louis Cathedral in th Easy. The one with eyes is deaf, the other one is blind. According to their owner when they are in the house they lead each other around. Thanks everyone. Mary we are awaiting the decision in his appeal. Adorable all, but the blind/deaf pair who lead each other around brought a tear to my eye. My daughter rescued a senior dog that had been given up after 8 or 9 years because someone in the family (probably a new child) developed an allergy. This rather large dog is so sweet that I let her sit next to me on my bed even though it drives my husband batty. She still exhibits separation trauma whenever she is left alone in a strange place. @arrieve: It’s just amazing how well dogs adapt, and can navigate familiar places so long as they have their sense of smell. My sister had a very elderly dog that had lost most of his hair and hearing, and all of his sight, and yet, he seemed quite content to stroll around her house, and was more than capable of demanding tummy rubs and other doggy delights. Lovely pics, and pets, and people! They’re all so cute! That smile is just too much.